Summer is finally here and this season is the most difficult time to be healthy and fit. For many people summer means fun in the sun, a time for vacation and outdoor activities like riding bikes, a dip in the pool and much more. 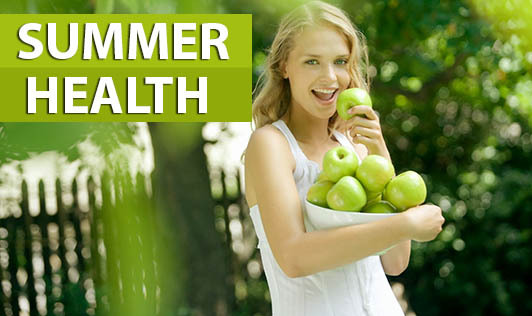 But summer also holds risks and staying healthy during summer is more than just eating the right foods. The hot and humid days can take a toll on you if you don't take the necessary precautions before stepping out in the sun. It is quite tempting to let your guard down on vacation but you can definitely stay healthy and have fun by incorporating healthy habits. • Tick borne illnesses, not caused by viruses but very common during summers such as Lyme disease, Rocky Mountain spotted fever and Ehrlichiosis. Tips to help you beat the heat! -Give your diet a berry boost. -Limit intake of fat and sugar; focus on carbohydrates, fruits and vegetables. -Use sunscreen and re-apply it frequently during the day. -Wear sun glasses and protect your eyes from the sun'sUV rays. -Avoid spicy and oily food. -Try to stay indoors when pollen count is high and if you do get outside, rub a small amount of Vaseline inside your lower nostrils. This can help prevent pollen from entering your nasal passage. -Keep your ears clean and dry especially after swimming. Also, wear ear plugs while swimming. -Use an insect repellent and drain stagnant water in your kitchen, and keep your surroundings clean. -Avoid exercising during the hottest time of the day; train closer to sunrise or sunset. So, it's time to get ready for summer by incorporating these simple steps to keep you healthy when the mercury is rising!